I was browsing Nordstrom late one night this week (I’m sure I am not the only one who iPhone shops in bed) and came across the new Draper James by Reese Witherspoon collection, I was super impressed! Such cute and affordable pieces, I adore the classic vibe with pretty details… think ruffle sleeves, bows and feminine silhouettes. These are a few of my favourite pieces from Draper James, plus some fun accessories I’m also loving right now… what do you think of Reese Witherspoon’s fashion line? I’d love to know, which of my picks below do you like best? Ever wondered what the best celebrity favorite beauty and health products are? I’ve done a little digging and found the products your favorite stars use and genuinely love. Read on for the low down on everything from Miranda Kerr’s must-have massage mat (it has amazing reviews on Amazon), to Kourtney Kardashian’s signature lipstick (which I also use and love). Have you discovered any celebrity favorite beauty products? Share them in the comments below! I love trying these things. Kourtney Kardashian, YSL Rouge Pur Couture Lipstick in #13 Le Orange. This has long been Kourtney’s signature color, I have it too and love the bright hue – it looks amazing on everyone. Lauren Conrad, Cle de Peau Concealer (I have this too and it’s worth every cent). Lauren also uses NARS Blush in #Amour and Chanel Soleil Tan Bronzing Makeup Base. The new Ivy Park by Beyonce collection has landed! Have you guys seen the pieces? I managed to get my hands on a pair of the Ivy Park Y High Rise 3/4 Leggings and think they’re just fab. I also adore these full length Ivy Park Y High Rise Leggings. They’ve almost sold out already though, so if you love something from the collection, snap it up! I like that you can return things to Nordstrom for a refund, I always shop and then send anything back I don’t love – so easy. Check out the whole Ivy Park by Beyonce range, they’re continuing to add lots of new styles. Sport luxe has been a major trend and it’s set to continue. Speaking to workout wear, I thought I’d also share LaVanila Healthy Deodorant. Over the last year I’ve become so much more aware of what I’m eating and using on my body, there are so many chemicals in products and until you start learning more, you don’t even realize! I love this deodorant because it’s all natural and actually works – I’ve tried so many different ones and some did nothing… this is by far the best. I came across it through reading reviews and forums online and also discovered earth mumma Kourtney Kardashian wears this deodorant too. Have you used an all-natural deodorant before? Is there one you’ve tried and recommend? To complete the perfect sport luxe look, a pair of mirrored sunglasses (I love the Beach Riot shades in silver flash, as below) and a carry-all tote bag are essentials! You’ll also find some more gorgeous sport luxe pieces from the adidas by Stella McCartney range. What do you think of the new Ivy Park by Beyonce collection? I love being comfy and find when I’m running errands or relaxing at home, I am often in leggings – so excited for this new Beyonce venture! 2016 Oscars Best Dressed – You Vote! Who tops your 2016 Oscars Best Dressed list? I always love seeing the red carpet arrivals and as the crème de la crème of award shows, the Oscars never disappoint. From the stunning gowns a girl can only dream of wearing, to the perfectly painted faces and immaculate hair that comes with having exclusive access to the best glam squads in town. Our favorite stars truly turned it on! Trends to take away? Green was a popular color of the night with Rachel McAdams, Saoirse Ronan, Cate Blanchett and Sophie Turner and Stephanie Bauer wearing this fresh hue that ranged from a rich emerald to a soft seafoam shade. The stars proved black is anything but boring, with Jennifer Lawrence, Julianne Moore, Jennifer Garner and Kerry Washington wearing this sophisticated color. The twist? They upped the ante with luxe textures, lace and embellishments. Fashion fails? Floral appliqué also seemed to be a thing with Cate Blanchett and Heidi Klum wearing this statement making feature, however I can’t say I’m a fan. 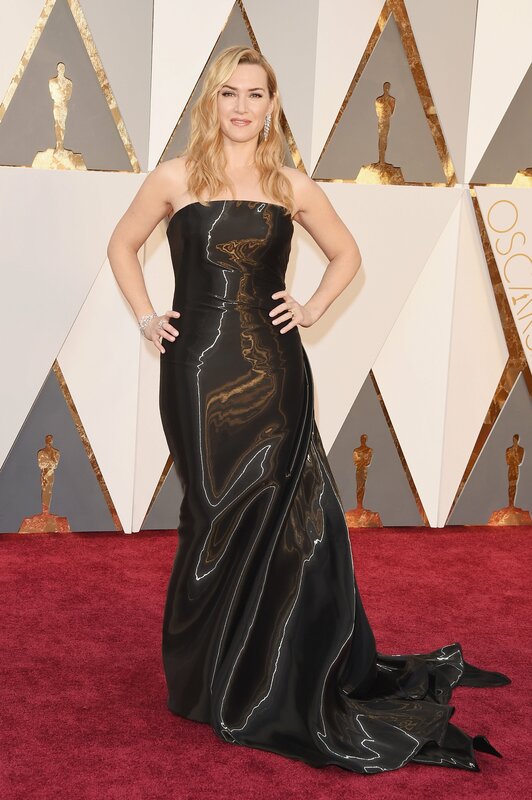 I also don’t think Kate Winslet wore the most flattering dress, I love a good metallic, but her liquid-look Ralph Lauren didn’t win me over. I’ve rounded up my 2016 Oscars Best Dressed, but want to know what you think! Cast your vote and comment below to share your thoughts. Who is your pick from my top five list? Is there someone else you loved that I haven’t listed? I’d love to know! As many of you probably know by now, I love my star news and part of that is getting the inside scoop on their celebrity beauty secrets! I constantly store little ideas and things to try in my head and thought I’d share some of them with you today. Gorgeous celebs including Miranda Kerr, Gwyneth Paltrow, Eva Longoria, Kate Hudson, Julia Roberts, Mariah Carery and Nicole Kidman have all shared their unique beauty tips and tricks. We’re talking everything from mayonnaise, cranberry juice, coffee granules and one I don’t recommend – leeches. The best part is, these celebrity beauty secrets all use common things we probably already have at home (minus the leeches, I hope)… so head to your fridge and get glam! Have you tried any of these? Do you have any unconventional beauty tips or tricks? Please share in the comments below, I’d love to hear about them! The gorgeous Victoria’s Secret model uses lip balm as a shimmer highlighter on her eyes, which gives a naturally radiant ‘lit from within’ bright eyed look. When breakouts occur, the actress reaches for apple cider vinegar, explaining it is an effective treatment for breakouts and skin healing. I hope you’ve all enjoyed a fabulous week! I’m so looking forward to the weekend… my Mom, Dad and I are flying to visit my sister and spend a family weekend together. Then I’m super excited for next week, it’s the start of NYFW! I can’t wait to see the shows and new season fashion – and of course share it with you! I’ve been hunting down the perfect shade of red for longer than I’d like to admit and after finally tracking down which nail polishes Olivia Palermo wears, I found it! Her favorite shade is Essie Lollipop – and let me be the first to excitedly say, it’s ahhmazing. Over the weekend, I stumbled upon some old episodes of The Hills and adored every minute of it. All that drama… Lauren and Brody, Heidi and Spencer, Audrina and Justin Bobby. Back in the day, I remember I watched it every week! So following this little blast from the past, my love of all things Lauren Conrad has been reinvigorated. What do you think of Lauren’s style, is this a look you would wear? I’d also love to know, did you ever watch The Hills too? I’m always inspired by what celebrities are wearing and Nicole Richie outfit’s are consistently on point. From a somewhat rocky start, she’s firmly cemented herself as a fashion icon. I believe that great style is truly timeless and this outfit below was worn by Nicole a few years ago – proving well chosen pieces never go out of style and are worth the investment. Every girl should own a chic white blouse, fabulous blue jeans and classic heels. Here’s your ultimate styling inspiration to create an effortlessly polished outfit… I’d love to know, is this a look you’d wear? I definitely would – I adore it! I’ve seen some amazing closets in my time (thanks, Pinterest), but I’ve never seen anything quite so exquisite as Khloe Kardashian’s fitness closet! This 150 square-foot closet is like being in an incredible boutique. Created by LA Closet Design, this space has it all… from the Fiji water fridge, to the glass accessories display case and the L-shaped shelves for her ahhmazing collection of sneakers (I was pretty chuffed with my four pairs, Khloe’s is on another level!). With multiple closets in her sprawling LA residence, she’s living a fashion-lovers dream! Kardashian says this closet is one of her most adored rooms, “I’m in love with my fitness closet! It’s my favorite closet. I genuinely show it off to all of my friends when they are over,” she said in an interview with Self magazine. Wow. Seriously, just wow. What’s your favorite part? I love that incredible shoe collection and the water fridge!